Special Containment Procedures: SCP-490 is to be maintained in Storage Garage 17-Golf. Garage 17-Golf has been heavily soundproofed, its door replaced with a soundproofed door with an interior code-lock. SCP-490 is to have all four wheels disabled through standard parking boots and is to be kept chained at all times to four molybdenum eyebolts, sunk a minimum of three (3) meters into a solid concrete floor. 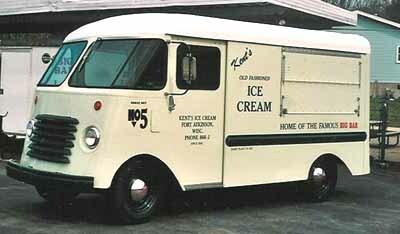 Description: SCP-490 is an ice cream truck dating to the 1960s constructed by ████. It seems to be mechanically standard except for the audio system, which does not respond to operators, though it appears to be in working order. The key to the vehicle is fastened in the ignition and cannot be extracted by any means. SCP-490 can be driven (fueled by a diesel engine originally made for the truck) and functions properly in all ways compared to other vehicles of the same model. Between 2 to 5 AM local time SCP-490 will operate itself, and drive at a low speed in a random circuit through local roadways. At this time it will function as if in peak condition, while playing a tune from its speakers. The tune has not been identified, but resembles music played on non-anomalous trucks of the same make. However, the tune never loops, and no portions can be identified as of yet. Recorded portions do not carry the anomalous effect. Any individual who hears the music will start advancing towards the vehicle, ignoring any instructions to stop. Upon reaching the vehicle, the back doors to the truck will open and the person will step inside with the doors closing behind him/her. The doors become sealed, impossible to open by regular means, and if tampered with [DATA EXPUNGED]. If there are multiple subjects affected then each will line up and wait for the doors to open again, or until the 3-hour window has elapsed. Subjects outside the vehicle when time elapses will wander away in apparent confusion; when interviewed, they appear to have no memory of the event. After 5 AM, SCP-490 will lose its abnormal ability and the back doors can be opened. Any person(s) that entered into the truck during the time that the music was playing will have vanished. A Popsicle composed out of basic sugars and human blood. A product of SCP-490. Photo by Agent Stephanie Shih. The freezers will have been stocked with frozen treats. Though the treats will contain traditional flavors (Chocolate, Strawberry, Vanilla), the wrapper advertises a surprise flavor. The "Super Surprise Flavor!" stated is human flesh incorporated into the product, which DNA testing has proven to be that of the subject(s) who entered the vehicle and subsequently vanished. Discovered in ██████, Massachusetts, SCP-490 was located in the parking lot of a bank, from which it was then towed to an impound yard. The object had a parking boot attached to it and therefore could not escape. Shortly after the disappearances of several residents from the nearby trailer park, a team of Foundation agents were sent in to investigate. Discovering the truck and its contents the team paid the fine for it and drove it to Site-17. During the trip, it activated, causing the death of all team members except for Agent ██████, who was driving the team's vehicle and realized what was causing his teammates to become entranced. Protocol A-████ was initiated and several more agents equipped with ear protection arrived. SCP-490 showed aggression, and when blocked by several Foundation vehicles started ramming into them and the Agents trying to capture it. After one (1) hour and forty three (43) minutes of chasing SCP-490 through back roads it deactivated and was moved to Site-██ on a flatbed truck.